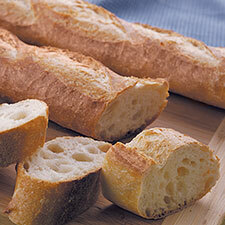 One of the first recipes taught in pastry schools is that of the classic french baguette. Now, I have not myself attended pastry school, but i have considered it a time or two, and almost all early curriculum’s that I have explored included bread making and in particular the making of a traditional french baguette. Once you learned how to prepare the perfect baguette you can use it for so many things! You can dip it in flavored olive oils, top it with salsa’s, make french bread pizza, and they are great for sandwiches! Here is my recipe for a classic french baguette, and below that the recipe for Stuffed Baguettes! Enjoy!! In a small glass bowl mix warm water, yeast, and sugar. Set aside and allow yeast to proof ( it should at least double in volume. In a medium sauce pan, scald milk and add salt, allow to cool. In a large mixing bowl on medium speed blend together the milk mixture, yeast, and flour until well incorporated and dough becomes thick and elastic. Turn out on a floured surface and knead for 8-10 minutes or until dough becomes pliable and stick fold over often to create pockets of air in your dough. Place in a greased bowl turn over to coat, cover with a damp towel and allow to rise for one hour. Preheat oven to 375 degrees. Punch down dough split into two and shape into baguettes. Place on a greased cookie sheet and make diagonal cuts along the top surface, allow to rise for another 25-30 minutes. Bake in preheated oven for 25-30 minutes. Bread should sound hollow when you tap on it with the end of a knife. Allow to cool on a wire rack and serve! Mix all ingredients together thoroughly until smooth spreadable consistency. 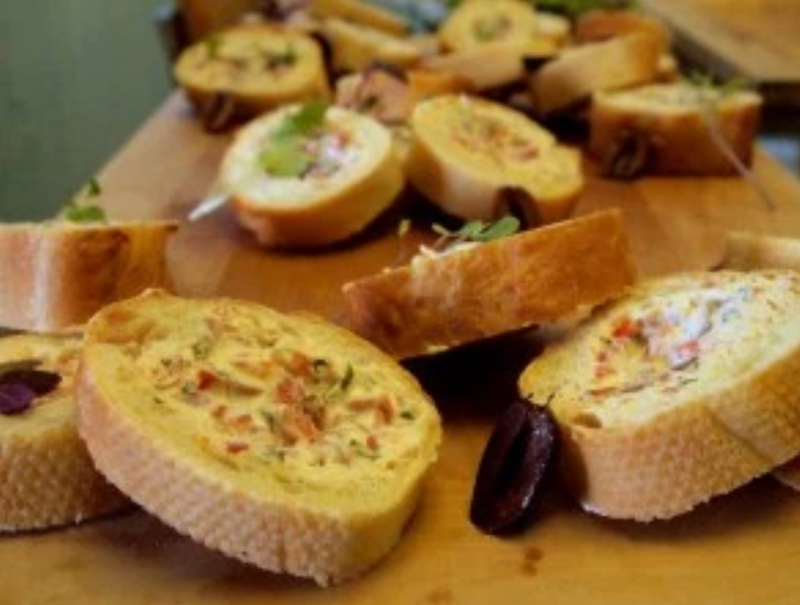 Use a coring tool to remove the cent er of the baguette and stuff with the cream cheese spread. Wrap in plastic and refrigerate for up to one hour, slice into 1/2 inch slices and serve! Yum! !